Congratulations on going back to college! Now, how are you going to pay for it? The number of working adults and other “non-traditional” aged college students has grown so much that some experts have recommended coming up with other names: non-traditional is now common. According to the National Center for Education Statistics, “traditional” aged students (18-24) make up a little more than 12 million students; “non-traditional” make up over 8 million. Working adults returning to college all have their own challenges, whether dependent children, a full-time job they cannot afford to leave, elderly parents who need care, or any of the many other challenges of adult responsibilities. But almost all have one thing in common: paying for college is a significant financial burden. Tuition costs are rising faster than inflation, according to the College Board, and show no signs of leveling out. But Value Colleges would like to help you out. Value Colleges is pleased to present the Finish It! 2017 Scholarship for non-traditional and returning students in the amount of $1000! Be a U.S. citizen as verified by a U.S. birth certificate plus government-issued identification or simply just a U.S. passport. Be a matriculated student at an accredited post-secondary institution (Full-time and Part-time students are both eligible for scholarship) or planning to enroll for 2017-18 school year. Complete and submit the Online Value Colleges Application Form and Essay (see question below), and email transcripts/recommendation to our editor. Applicants must consent to provide first and last name and a quote for display at ValueColleges.com if notified as a winner of the 2017 Finish It! Scholarship and adhere to our Terms & Conditions. Complete the Online Application with your name and contact information. Our question to you is simple: What next? Thousands of working adults and non-traditional aged students are returning to school every year, but what are they going to do with that degree after graduation? Tell us what goals and dreams you have that your college degree will help you accomplish. 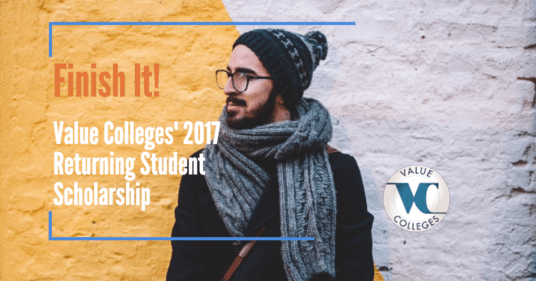 Value Colleges will accept applications and essays for the 2017 Finish It! Scholarship up until June 15, 2017. All submissions must be in by 11:59 p.m. (Eastern Standard Time) June 15, 2017. 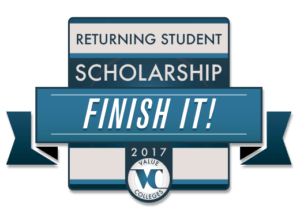 The Value Colleges Scholarship Committee will review all essays and after a final decision will be made, recipient will be notified by email or phone on or around August 1, 2017. Shortly after, a letter and $1000 check (made payable to student) will be issued.